One of the most enjoyable things for me when it comes to delivering my client’s orders, is putting their package together. After spending the time to make the portraits, pouring my heart into the editing, and working with the lab to get the prints *just* right, it would make sense to package the prints in the loving fashion they deserve. I want my clients to enjoy the entire experience of choosing me as a photographer. 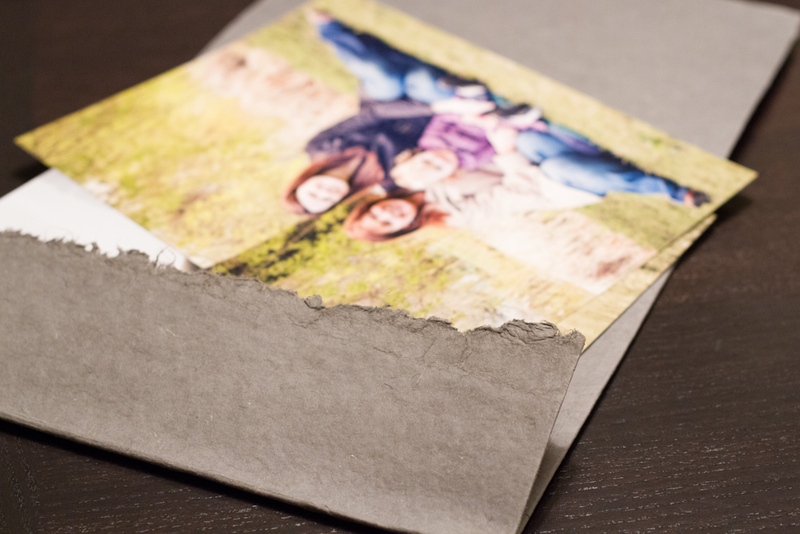 That starts with the photo session and ends with opening up their prints. So I set out to find the most beautiful, yet environmentally sensible packaging I can find. When I finally pulled all the components of the packaging together, I was very excited. I want to share them with you here. The portrait case is stamped with my logo with white ink. Here you can see the torn edge of the handmade paper. I love little details like that. The portrait case is then closed off with a mesh ribbon and bow. Thanks to YouTube, I learned how to tie a bow. Whenever someone buys a print, they also receive the digital file of the image on a DVD. 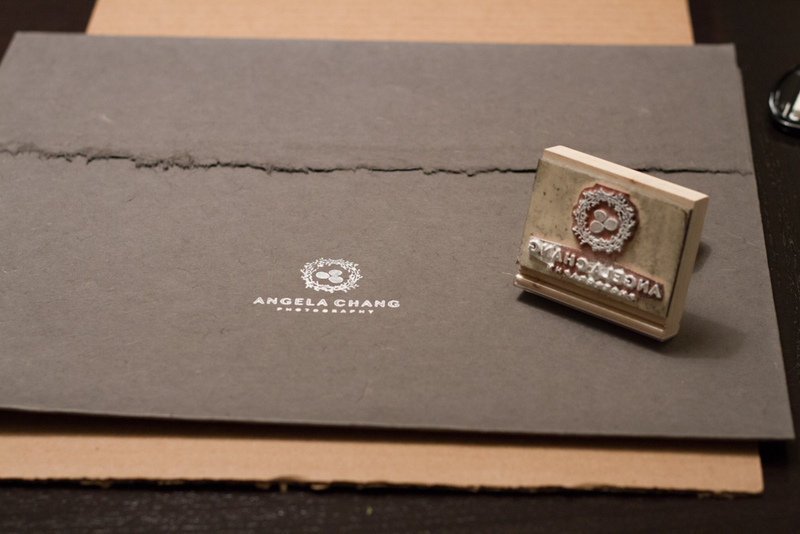 THe DVD is inserted into a CD case made of the same handmade paper as the portrait cases. I use yellow and grey baker’s twine to tie the case. 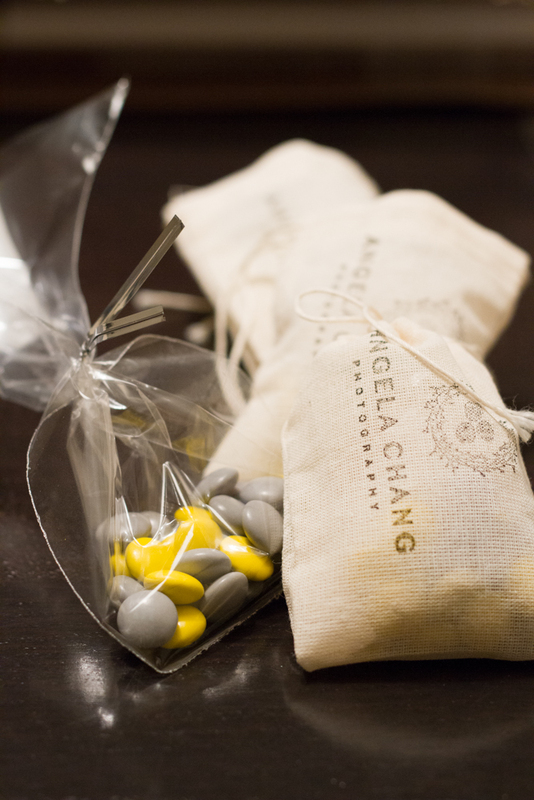 Next, I put some yellow and grey M&M’s in a cello bag to stuff into a muslin cloth bag for my clients. When they open their package, they can have a little sweets while enjoying their prints. The muslin bag is also stamped with my logo. It contains M&M’s, some referral cards, and my business cards. I love how the entire package looks when they are put together. The portrait cases are stacked and tied together with the mesh ribbon and bow. Here is the whole package put together for someone who ordered two different sizes prints. 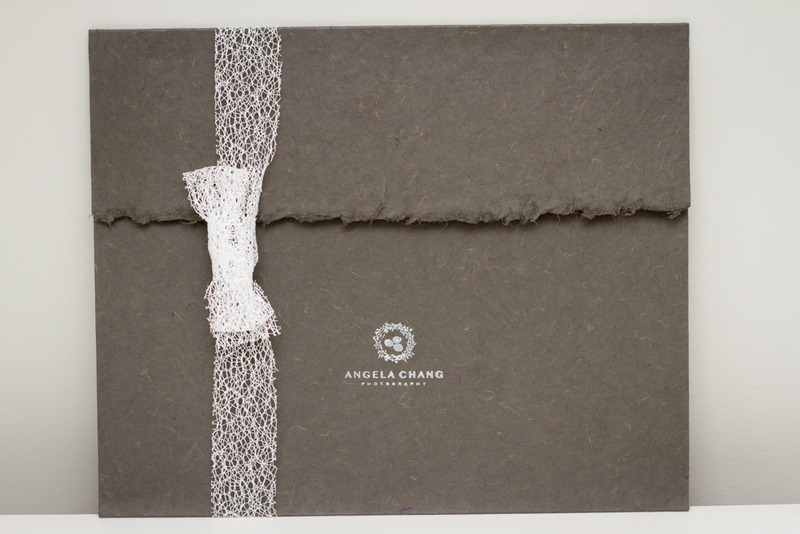 Lastly, the whole package goes into a recycled paper bag in the same dark grey color. These bags are for prints 11×14 and up. 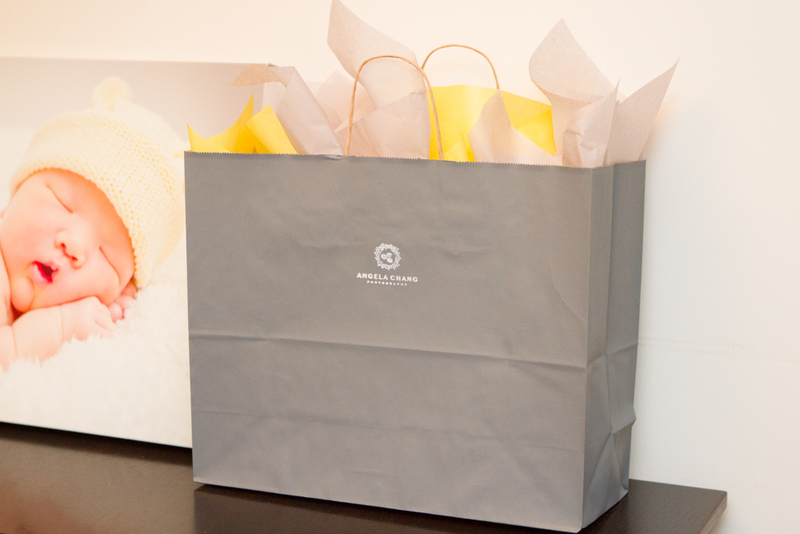 The final look: dark grey paper bag with yellow and grey tissue. Inside the bag: portrait cases, CD case, muslin bag of M&M’s, and a thank you card. 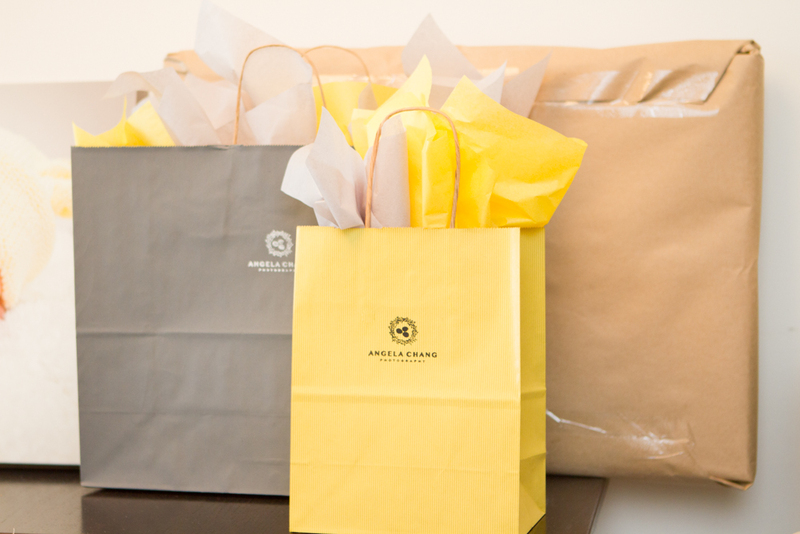 For prints that are 8×10 and smaller, I have a yellow paper bag for them. The yellow bag is for 8×10 and smaller prints. Right now I do not have a smart solution for delivering canvases. As you can see above, the canvas is wrapped in kraft paper. It irks me a lot that everything else looks so good, and yet the most “grand” product (gallery wrapped canvas on 1 1/2″ stretch bars) gets wrapped in boring brown kraft paper. As I type this, I think I’m coming up with some ideas on how to dress the canvas packaging better. I’m going to work on them and see what I end up with. I’ll blog about that another time. I had so much fun putting the packaging together. I hope my clients like it! 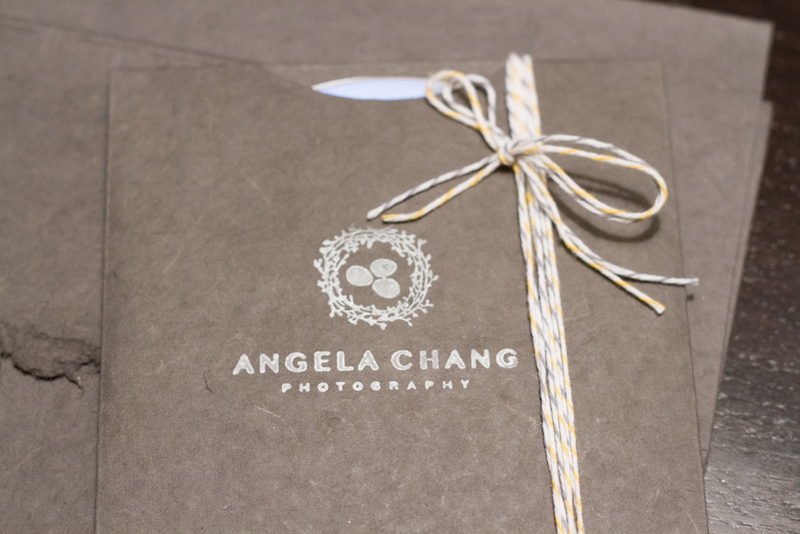 This entry was posted in Photography and tagged packaging, photography, Vancouver by angelasaito. Bookmark the permalink. I like the packaging you picked. It looks great. Classy operation, you’re running, there. I love your logo! Are you in Vancouver? Maybe Paper-ya has some nice grey paper? Sorry didn’t finish my thought! Some nice grey paper to wrap the canvas in + some washi tape to finish it off? Thanks for visiting my blog, and thank you for the thoughtful comment. I LOVE Paperya! I will definitely pay them a visit to see if they have something I could use.